When I first started doing set reviews I was rating them based on intuition. That allows for a lot of personal interpretation and over time things will get sloppy. Which is no help for any of you when I'm doing building block set reviews as you're looking for fairly concrete information as to why you should, or shouldn't, buy the set I'm discussing. So I decided to be critical about why I'm being critical. I've come up with a series of questions and attendant point values that will give a clearer picture of how useful a set may be. I'll be using this system from now on for my reviews. 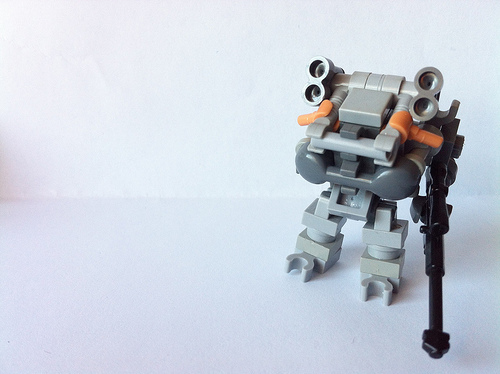 As I mentioned elsewhere, I built a frame from pieces in the Land Defense Battle Pack set. I'm calling it the Bullfrog. I'm thinking it's a standard soldier loadout (2Rd/1B/1Y/1G/2W). It has a gun, an armored cockpit, a comm antenna, and those funky legs for attachments. Back in May of last year I proposed the Single Set Challenge. This design almost qualifies. I had to use one extra piece from a second Land Defense Battle Pack. To finish out Review Week 2, I present to you the Kre-O set "Combat Chopper". The box. Once again, something I purchased on Clearance. Kreons. Just two this time around. I can't quite figure out what to do with that Alien Kreon body. It's like the Lego Robot Bodies but bulkier. There's also a "flame" piece that might look good in action pictures. Parts 1. See those bricks in the middle-bottom section? They don't have studs on the other side. Parts 2. Bricks and clips and tiles and plates. Oh my! Parts 3. Those landing gear pieces in the lower left look like they might be interesting. The Kre-O version of the Lever & Base in the upper middle section of the picture is pretty neat too. Parts 4. Yeah, you get a fair amount in this set. A lot of it in Olive Green. That canopy piece will be hard to work with though. That brick with the red protrusions in the top left corner is for rotating the helicopter blades manually when the set is built. Using the new rating system -- which I'll share in a future post -- this set comes out with an A. Once again, try and get this on sale or marked down in some manner. I received this as part of a sale at TRU. It's one of the small Star Wars sets that are currently available. This is the bag it comes in. Instructions and small parts. You can see a couple of Clip Tiles, a couple of Lampholders, and a couple of Minifig Neck Brackets. It also has a few 1x1 Plate w/Teeth and 1x1 Round Tiles. A fair assortment of parts. Here are the larger parts in the set. What's of most interest is the 3x3 Plate in the upper right hand corner. I could use that for my Block-Chest frames. Since I received this as part of a sale, I didn't pay very much for it. (Spend $20, get it free) It normally retails at $4.99 or so. It hits the sweet spot for price but only has a handful of really useful parts. By my new rating scale it should be a B+ but I don't feel that it deserves to be rated that high. Continuing on with another week of reviews, we come to my first Battle Pack review. Essentially an "army builder" set it features a bunch of Kreons with enough parts to build a small playset for them. The box. As you can see I purchased this one on clearance. The instructions and sticker sheet. The stickers are a little on the large side and probably won't come in that handy for other builds. Here are the Kreons from the set. Three good guys, one bad guy. If you look at the upper left bag you can see a treat. There's a minifig scale shoulder mounted rocket launcher. Here we have some of the parts from the set. I really think the ring w/handle in the middle of the picture will make a great greeble. The clip on wings are nice. As is the 1x2 w/handles in the lower right corner. The "seat" in the upper left should have lots of SNOT uses. Here we have the remaining pieces of the set. You can see the 1x1 Round Brick "gun muzzles", textured Cheese Slopes, and Ammo Chains everyone likes. What intrigues me is the two part "turntable" that is two plates thick as opposed to the standard Lego version. Theose are the grey and black pieces over in the two left-most columns. Then there's the two "Handles w/Stud" in the upper middle of the photo and the weird SNOT Clip block, that's actually a two part launcher, in the lower right. As you can see there are a fair amount of useful parts in this set. Unfortunately at $13 for 81 pieces that's $0.16 per piece. On clearance at $7.99 it's $0.10 per piece. Luckily I bought it during one of Kmart's "1/2 off Clearance" sales and I only paid $3.99. You might be able to make a complete mech from this set, but at that price I have to give this a C+. Here's another Kre-O set review. Okay, I admit it, I can't help myself. The pieces that you can get with Kre-O that you can't get with Lego intrigue me. Here's the box the set in question is packaged in. I will say this for the Kre-O sets, they do have sturdier boxes than Lego. The stickers and the instruction book. Here are the parts. You can see the parts that compose the "snake mech" running down the right side of the picture. Up at the top you can see a cylinder that looks like the barrels of a Gatling Gun. The 1x1 with a double bar down near the bottom looks really neat. The "robot claws" over on the left side look useful. They actually have more attachment points than the Lego version. Last, but not least, we have the Kreon for the set. Again we see a 2x2 Neck Bracket. I see a good looking helmet and more "wheels". I'm not sure what I might do with the latter. The website lists this at $3.99. Toys'R'Us, where I got mine, has it at $6.99 At MSRP, 49 pieces is a great deal -- $0.08 per piece. AT TRU pricing, $0.14 per piece, not so much. So try and pick this up on sale. I give it a B- as the set consists mainly of accent pieces. As I've mentioned before, this is one of those sets that's good for getting the parts you need for MFZ. I've finally purchased one so let's take a look at it, shall we? This is the box the set comes in. Here are the two instruction books. Here's Razcal, the minifig for the set. I really want to use that helmet as the head for a mech. This is the first bag of parts. Look at those wing-like pieces. It's been a while since I've seen a 1x4 Plate w/Arm Down in a set. The new brackets are nice too. And the Technic Axle and Pin Connector Perpendicular Double Split have come in handy before. This is the second. Those printed tiles in the lower left are really nice. Darksyntax has already put them to good use. I've used the Crescent Blade before. There's a preponderance of Mechanical Arms. The Pneumatic Hose Connector w/Axle Connector is really intriguing me. All in all, this is a great set for parts. If you can find it at the right price, grab it. I give it an A. Okay, so I caved in and bought more. This is the bag from the first series of Micro-Transformers. This is "Blast Off". I've just noticed now the helmet is missing. The 2x2 neck bracket is an interesting piece. I think this is "Crankstart". This is a 1st series Micro-Transformer. I find the translucent color of the gun neat. This is the one I'd wanted since I first got a look at the Micro-Transformers in the 2nd series, "Airachnid". Those claw/leg pieces look great. The clip-on missiles could be great for SSRs. The 1x1 plate with 2 vertical clips could be very useful too. Once again, get these on sale if you can. Of course being able to buy the ones you want will help immensely. This was intended to be a post about terrain and building things in scale, then I saw the final photo and had to add it in. I chose the first two because they are excellent representations of things that could be terrain on a gaming table. The third one's just awesome. 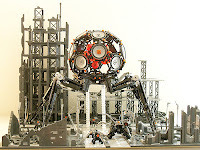 This one could almost be called "See what's been on Brothers Brick!" 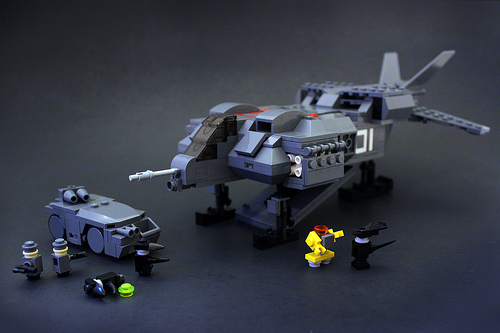 The APC is the wrong scale in relation to the "people", but that dropship is great. 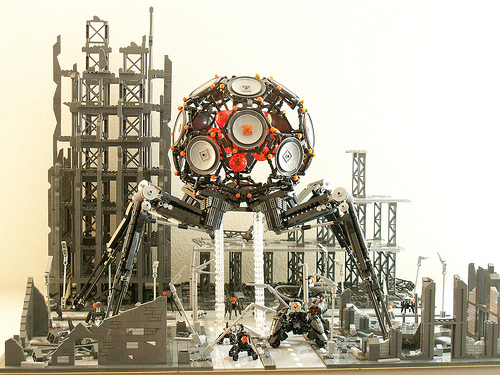 Lunar Module Eagle (Apollo 11) by hajdekr. 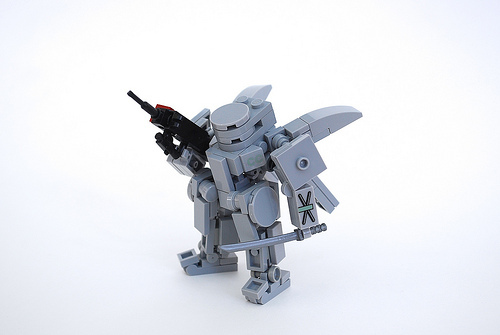 This last one caught my eye because of the insane number of fantastic smaller mechs. Dig into his Flickr stream and look at some of the other shots of this diorama. It's very much worth it. This one is an experiment and it's probably not going to go any further. It's a combination of someone's leg designs -- I'm not sure who -- and the torso techniques from Zeekhotep's Linebacker frame. It works, but I'm not "feeling it". 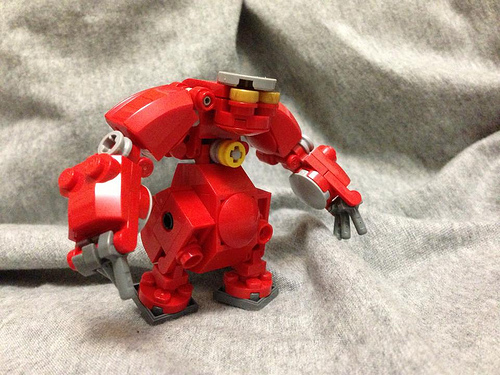 Another post featuring random mecha creations. Go! I really like the way this piece is put together. Looks sturdy. I know, Ironsniper again. Dude's so damn prolific though. Sharp Shooter by Dawn 'til Dusk. I'm not one for modifying bricks. I don't think I'd be that good at it. The same with painting bricks. But there are those in the community that do. MittenNinja did a post on painting Lego here. Now there's a new one. Courtesy of Brothers Brick. It's really interesting, but there is a bit of crap you have to sit through before it gets to the meat of the matter. Here's a couple of blogs that might be of interest to the community. I stumbled across Bricks & Bloks while looking for info on a polybag. This site reviews both Lego and clone brick sets so it'll be of interest to those of us who are heretical in our construction ways. Brickset introduced me to another new blog, The New Elementary. 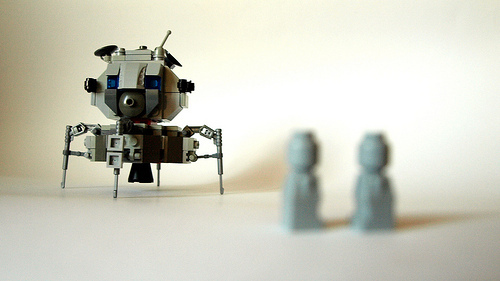 This site features articles on new Lego pieces. This one looks really interesting, keep an eye on it. I show a lot of photographs on this site, mine and others. I've never talked about the set-up necessary to take those photographs. As you can see I shoot outside so I'm at the mercy of the weather and sunlight. Here's a closeup on my lightbox. Here's what it looks like when I'm actually going to take a picture. Here's a tutorial for a DIY Inexpensive Lightbox. Hopefully this gives you more of an idea of how to proceed with your own photos.